silly, but I just had to show off my coral ring. in better spirits next post! Hope you feel better soon hun. Love the bow tie, I'm trying them out myself too. i like it!So interesting combination! The bag is unbelievable. I like the coral ring, too. That bow looks quirkily perfect! Touch of french flair and a bit of babydoll combined. Hope you feel much better soon! Loooovely as always! I want that sweater! :) The ring is also very pretty! I hope you feel better soon! The pink skirt and sweater are really cute. You look amazing, and I am in love with everything about this! p.s. I am following you! I'm in love with the tights/skirt.. so chic girl, you are fabulous! Check out my blog for some great giveaways! This outfit is perfect, love your bow tie, so cute. pretty lady! i love that bow tie. You always look so pretty and adorable! =) Hope you feel better soon!! I love this outfit! One of my favorites! I'm horribly ill right now too so I feel your pain - but you look great (I'm a snotty, sweatpants-wearing mess) and I love the bow detail! Awww, I hope that you feel better soon. ): Getting sick is the absolute worst aspect of winter without a doubt. But you still do look super cute. 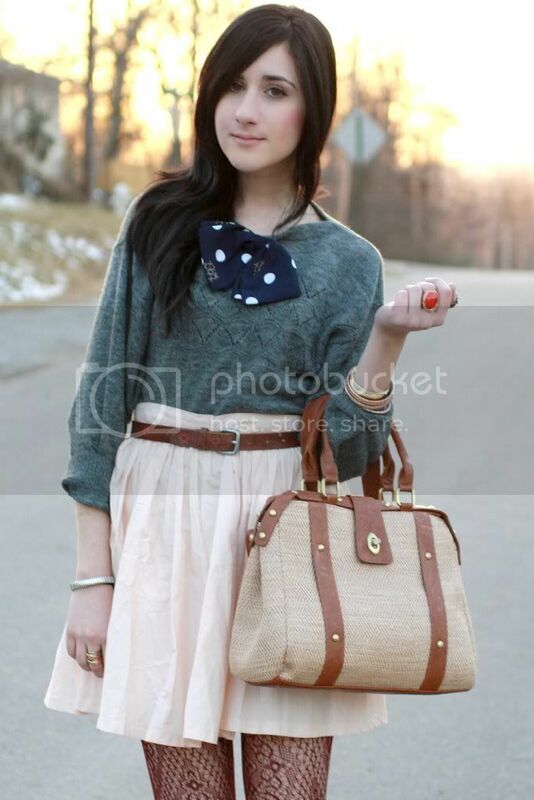 :) Your skirt and the bow are so sweet, and I love the design of your tights! i love that bow! and the soft pink of the skirt .. so pretty! That little bow is adorable. You are adorable. That ring is adorable! I love it all! When you come to Italy? love the ring and the bow tie... very classy! want to follow each other? would love to :) happy weekend. I hope you'll be feeling better soon. :) The colour of you ring is gorgeous. Cute bow:) Get well soon!!!! Your bow tie makes the outfit, it is so adorable! anyways..love your sweater..and those patterned tights!!!! It's kinda crazy how cute you are - obsessed with this outfit! I love you added the bow. Really cool accessoire. The colour of your skirt is beautiful. Love it with the grey sweater. Hope your ballon head has disappeared and you feel better now. gosh im wondering how many cute items are in your closet bonnie. 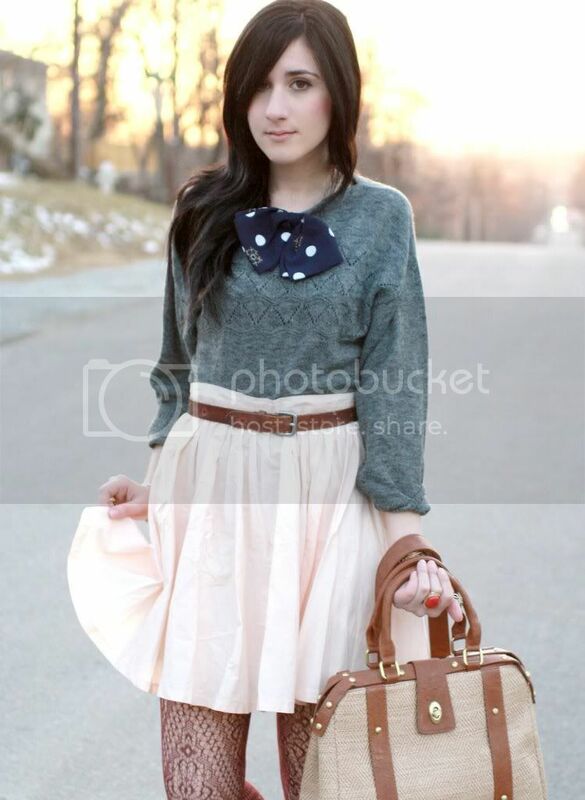 that sweater is pretty cute and love your skirt! Hope you feel better soon! I love everything abou this outfit! i love love love your skirt! totally love the jumper and the stone ring! Love it love it love it..
Hope you feel better soon! I've been sick too...drinking loads of tea makes it a bit better though! 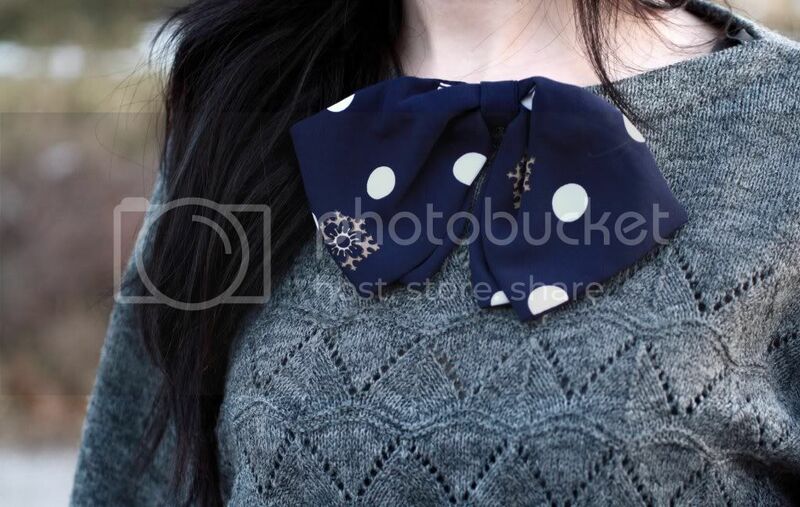 Love yr ring and the bow on yr sweater, so very cute. I LOVE YOUR OUTFIT & RING! Your blog is amazing ! Oh your shoes ! I want them ! You look lovely :) The ring is a great pop of colour. this outfit is simply adorable! I love your style!! I hope you feel better soon! I really love your bow! You really have amazing style. I'm sue your pajamas are just as stylish. Maybe you should pin a bow to them just in case! This is so cute! Love the bow and I really really need to get me a pink skirt of some sort. Thanks for your comment hon'! it is beyond me how you find the time to reply to all the comments you get :) you look gorgeous as always, the little bow is my fave! I love the sweater. I can never have too many grey sweaters in my wardrobe. J'adore le petit côté preppy de ta tenue !!! This is such an awesome colour combo! The lighter warmer colours from your waist downwards and the colder darker colours on the upper part, very cool! And these tights are amazing, the perfect eye-catcher! You look pretty as usual. Hope you feel better soon! oh no. it is horrible to have to suffer from any sickness. I have a cold too. I hope you feel very better soon!!! gorgeous color combinations in the outfit. I love your style so so so much!! Not to mention how stunning you are!